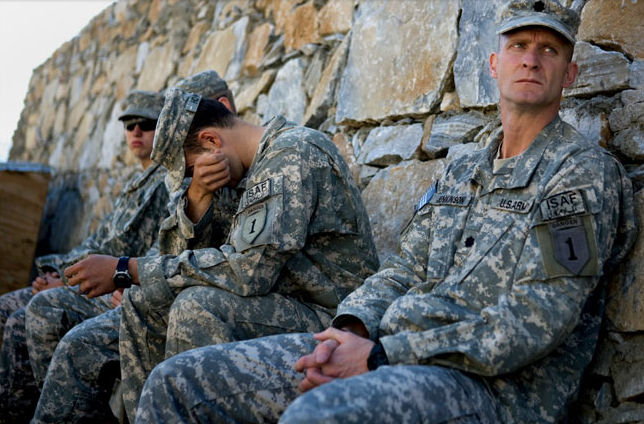 It is generally referred to as the “1,000 Yard Stare,” the blank, “no one is home” expression on the face of a combat veteran who has simply seen and done too much. No longer capable of adapting to the stresses and utter insanity of a troglodyte world of violence, the soldier becomes emotionally detached and disaffected, his humanity apparently leached from his body which remains something of an empty shell. It is arguably as old as war itself, but it was made popular by a Tom Lea painting that appeared in Life magazine during WW II and has become something of a visual trope for the devastating psychological effects of combat ever since (here, here, and here). I was reminded of the 1,000 Yard Stare this weekend when I came across several photographs in the NYT that accompanied a story which wondered how high a price Americans were willing to pay in order to defeat the Taliban in Afghanistan. The article itself was characteristically balanced while failing to point out the minimum costs we have already expended since 2001, including 440 billion dollars, as well as 869 U.S. military fatalities. But the pictures themselves seem to tell – or show – a different story, posing the question in a slightly different register. That the photograph is identified as having been taken in April might at first seem insignificant, a comment that functions little more perhaps than to mark the image as a file photo that has been hauled out of the archive to depict a somewhat ordinary and regular event. The real significance of that fact only becomes clear when we see the second photograph. The caption here reads “Grief: Eight days after he died in the patrol depicted at the top of the page, Pfc. Richard Dewter’s patrol held a memorial service for him.” It is not clear if the soldier featured in the top image is Pfc. Deweter or not, but in one sense at least it really doesn’t matter as the caption to the second image directs us to the pronounced, tragic pathos of the first image that now has the quality of an “about to die” photograph. But more than that, the second image repeats—and in repeating regularizes—the affect of the first. Once again we see a soldier somewhat physically detached from his patrol, with them and yet apart from them. Note too that while the expression on his face is not quite yet the 1000 Yard Stare, neither is it the “grief” towards which the caption directs our attention and which is clearly expressed by others in the image. And once again we see a soldier whose body is apparently incapable of responding to the natural demands of the moment as he gazes off into what would seem to be an almost certain future. The visual analogy between the two photographs, invoking another 800 Yard Stare, suggests the inevitable, tragic conclusion: here too is a soldier about to die. And the question remains. 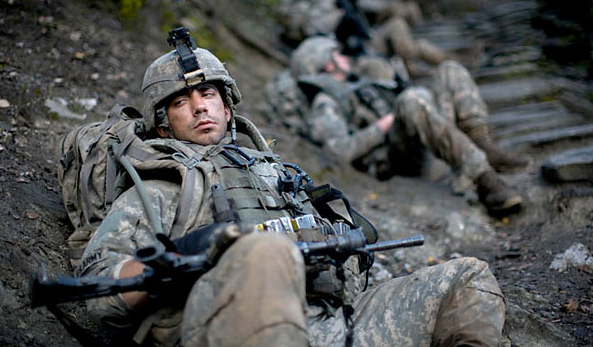 What price are we willing to pay in order to defeat the Taliban in Afghanistan?